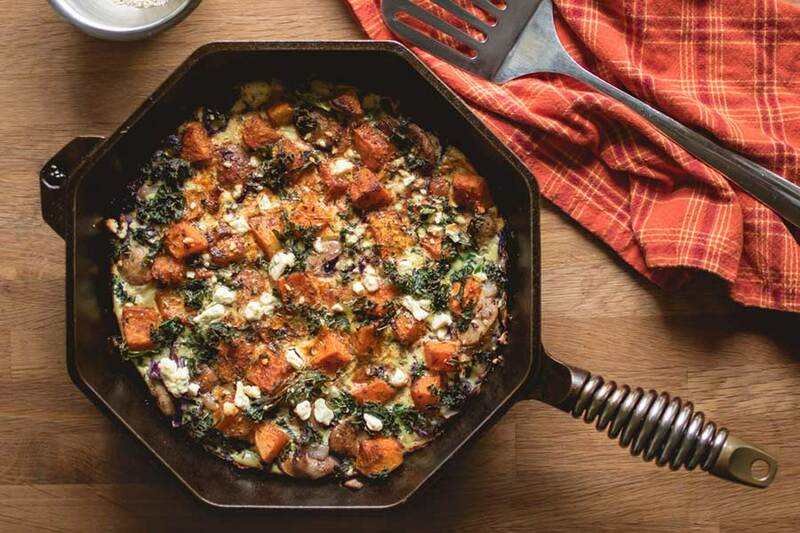 Traeger Roasted Butternut Squash Frittata with Sausage, Kale & Feta | FINEX Cast Iron Cookware Co.
For the Traeger owners out there, this is a simple Sunday morning favorite amongst the FINEX family. You already know the best thing about cast iron is it’s indoor and outdoor versatility. No other cookware goes from stovetop, to oven, to grill, to table so well—and this recipe will show you just how much you can do with your cast iron pans. It’s pretty hard to turn away food that hits the nose with that subtle smoked aroma and this frittata gives you just enough that leftovers won’t happen. You’ll love that it’s both savory and a little sweet, packed full of veggies and quality meats for the perfect Sunday morning brunch for family or friends. Set your Traeger grill on smoke and let it get going (4-5 mins, lid open). While that’s getting going, prepare the squash.You can use pre-cubed fresh or frozen butternut squash, or peel and cube a fresh butternut squash yourself. We peeled, cubed and roasted a whole butternut squash for this recipe, but saved most of it for later. You only need a cup-and-a-half so roast up plenty and use for other dishes throughout your week. It’s great with for a quick scramble. Add your cubed squash to a medium mixing bowl. Lightly coat with olive oil (depending on how much you’re roasting, this will vary). Add paprika, ground mace, salt and pepper to taste, and honey. Stir and coat evenly. Using your 12″ FINEX cast iron grill pan (or any baking pan), place the coated squash evenly on the pan. Place the squash on your Traeger and smoke for 20mins first, using apple, pecan or cherry pellets. This will also warm up your cast iron pan to get it ready for roasting. After 20 mins on smoke, switch your Traeger grill to its highest setting (450) and roast for 20 more minutes. Stir occasionally, and remove once you have an even appearance of golden brown on your cubed butternut squash. While the squash is roasting on the Traeger, go ahead and prepare all additional ingredients. Get everything in mixing bowls, crack the eggs and whisk with salt and pepper to taste. Leave aside. 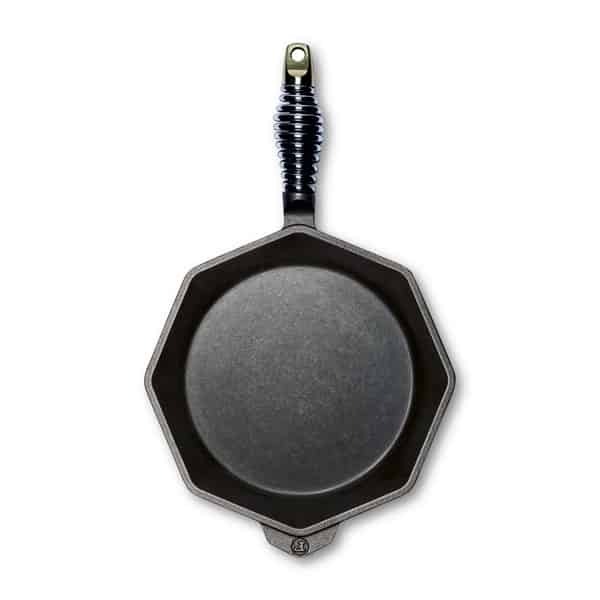 Using your 12″ FINEX Cast Iron skillet, preheat on medium-low for 5-10 minutes. Add bacon, cook until crispy, remove and drain pan of fat. Quickly wipe down the pan with a towel. Chop crispy bacon into small bits. On a medium heat add a little olive oil to your cast iron skillet, then combine sliced sausage, diced onions and chopped cabbage. Stir and saute until sausage is golden brown, onions and cabbage are caramelized. Remove from heat and drain excess fat. Squash should be done too, so remove that from your Traeger and set aside. Depending on how much smoke flavor you want, you can finish your frittata in the oven or on the Traeger. Set either one to 375 degrees and make sure they’re ready to go. Evenly spread out the sausage, cabbage and onions in the cast iron skillet. Sprinkle bacon bits over everything. Place the cast iron skillet in the oven or on the Traeger and bake for 15-20 minutes, paying attention to the middle for appropriate doneness. When done, grab a trivet and place at your table to serve directly. Finish with a sprinkle of infused garlic salt from Jacobsen Salt Co. This dish is full of savory flavors and colors that will make your Sunday delicious. We hope you enjoy!